This project is done by MVRDV, a name known to blend architecture, urbanism and landscape design together. Montenegro is where this luxury hotel is located. It is a strong-growing economy touristy due to its rough and unspoiled coastline. Some are heavily developed and most are not. On a piece of this untouched coastline, this resort with a hotel is projected. The design intention is to combine exclusivity with a responsible sustainable embedding of the project in its surrounding landscape. Therefore, the attraction of the Montenegranian landscape could only be maintained by preserving its rough beauty. The whole project was designed to be as an offset to the terrain and covered it with a blanket of the original landscape. Where a higher density was needed, they lift the blanket to create a hill. To form the iconic hotel, a dramatic overhang was created by pulling the blanket in front of the cliff. The flatter parts of the landscape hold the villa’s organized around their private patios facing the sea. The reason why I chose this project as my case study because it expressed the concept of keeping the natural beauty of the site, which is my intention of the design direction. The hotel looks like it hides under a lush green hill top that has been pulled up as a blanket. As it said on MVRDV’s website, this aesthetically appealing resort will house 115 apartments, 87 hotel rooms, a restaurant, a pool and parking lot and retail spaces. Imaging all these activities happened beneath the eye level, isn’t it like some vanishing generations’ mystery inhabitation? From my point of view, it is a sort of bio-mimicry idea from those creatures live underground. However, all the circular openings also make it accessible to light and up-ground. My original thought of this project is that I consider the whole site as an entire natural landscape park, where minimize human invoice. And I also want to borrow the idea of wrapping the landscape into the building design as a blanket. Moreover, the night view by the water was amazing. Lights illuminate the whole mountain spot by spot, just like a stars blank night. The Paul Klee Center in Bern, Switzerland is a museum designed by Renzo Piano to contain the works of Paul Klee along with housing a concert hall and temporary exhibits. 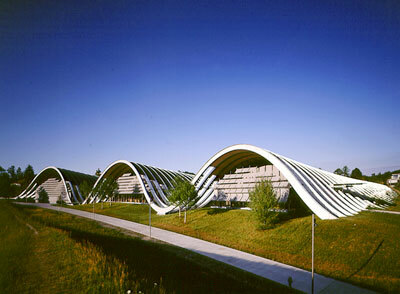 The building consists of three hills that are reminiscent of the nearby hills and landscape. Because of this form, the buildings become an integrated part of the site, the back and sides of the buildings slope down to the ground while the ground slopes up creating a near seamless transition between the landscape and the building almost as if the building was slid into the side of the hill. Each of the hills contains an exhibit focused on one of the aspects of Klee’s artistic abilities, painting, poetry, and musician, and are all connected with walkway at the front. I think this project is relevant to the Fort Ancient site since it also contains hills to respond to and anything built on opposite sides of the mounds would need to be connected some way. Unstudio completed this design for a 2009 competition from the People’s Government of Yanqing County, and the Beijing Institute of Architectural Design. Called the “Creative Zone,” this site intervention along the edge of Beijing’s urban fabric is an original interpretation of an “architectural park”. Its expansive pathways, open-air structures, enclosed spaces, and architectural interventions make up a complex matrix that covers 70% of the 150 square meter site. As the studio developed the site plan of the work, they looked at the sharp urban fabric lines provided by the city, as well as the fluid, organic forms and line provided by the neighboring water line. Their intervention effectively connects the two discordant geometries, blending their properties, and providing a link that is visual, organizational, and experiential. As the structures and pathways blend and bleed into the landscape, they interact with the topography, vegetation, and waterways, formally acknowledging and interpreting the achievements of a traditional chinese garden, focusing on the concept of “one view per step”. This results in a seemingly effortless beauty throughout the intervention, providing a rich, but not overbearing, sensory experience. In terms of function, the more enclosed elements of the intervention are home to displays of impressive and innovative examples of new and modern design. The structure is divided into four primary experiential portions: think, develop, produce, and sell. This approach shows patrons not just the designs, but the work, thought, and process behind their ideas and development. The project thus integrates its function into its already complexly developed site intervention. The terrorists attacks of September 11, 2001, left enormous voids to be filled by the World Trade Center Towers. The goal now was to take the site which has now become a national symbol of patriotism and a memorial to people who died, and honor the victims and heroes, while moving on and making the space functional again. 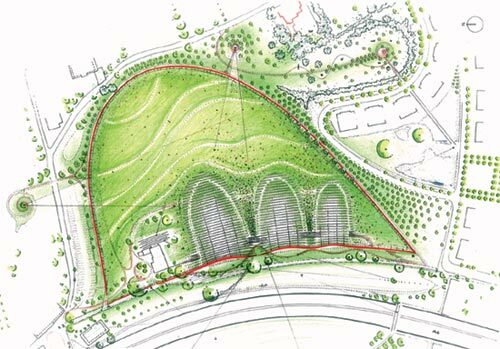 The city was sent over 5,400 design proposals for the sacred site, and I was interested in how all of them were different and how each respected and determined what they felt was important about the site. The Pilgrim Route, or Ruta Del Peregrino, is a 100 km pilgrimage route in Guadalajara, Mexico that 2,000 religious advocates walk each year. This pilgrimage is through an open site, that doesn’t contain any buildings or dwellings, so the Secretary of Turism held a competition to commision 9 monumental installments within the site. The interesting thing about this site is the fact that each installment is completely different, and yet they all share a similar purpose: to create a temporary dwelling that makes views and break points. One of the more interesting projects is the HHF concrete lookout point. A very simple structure, this spiraling work encloses the pilgrims as they enter, and then as they move up a spiral staircase the structure moves away, revealing a fantastic view. Other installations, like the Elemental Lookout by Alejandro Aravena and “Walk the Line” by Ai Wei Wei are other large lookout installments, that direct the views of the pilgrims to site-significant points and landscapes. Other installations, like the Derek Dellekamp Arquitectos and Tatiana Bilbao MXA, abstracted a cross, creating four points that obscure views and create a spiritual gathering space while the hermitage is a few sharp folding screens that create a short break point and shelter during the walk. The final piece of the walk is a large concrete ring called Void Temple, that seems to be more of a sculpture than architectural component. The design intent of the entire pilgrimage was to make natural structural installments that would, with time, become integrated with the surrounding landscape as plants and animals took them over and moved in. I find this really interesting because it makes me think of the Fort Ancient Site itself: 2000 years from now, what will these installments look like, and how will people be treating them? This site design is a combination of installations that ignore site, bend the site, and work with it, but eventually all the structures will become integrated; one with the pilgrimage. In the early 1990’s, discussion began of designing the first American museum dedicated to the Native American Indians. Although the site of the proposed building, on the National Mall in Washington DC, was an obvious source of possible inspiration, the context that most needed to be addressed was the thick history of the Native American tribes. Early dialogue on design formulated several different concepts on which to build the design in direct relation to cultural elements. First and foremost was the idea of riding the fine line between formal and informal space while maintaining close proximity to nature. Francis Hayden states in an article from The Smithsonian, “the landscape flows into the building, and the environment is who we are. We are the trees, we are the rocks, we are the water. And that had to be part of the museum.” The exterior and interior form is derived from the thousands of years of erosion left by the wind and water on rock formations. Then in addition to physical connection, it was suggested that spiritual connections be expressed architecturally through the creation of an opening to the sky and an east-facing main entrance. The relationship between the Museum of the American Indian and our project at Fort Ancient is uncanny; therefore there is much to be taken from this case study. With all of the rich cultural influence of the American Indian Museum on site at Fort Ancient, the concept simply must be naturally informed. As the exterior and interior form of the museum was derived by the elegant force of wind and water, so the contour of Fort Ancient should be forged by the dense piece of history upon which it will stand. Only through respect will this collision of generations be successful. 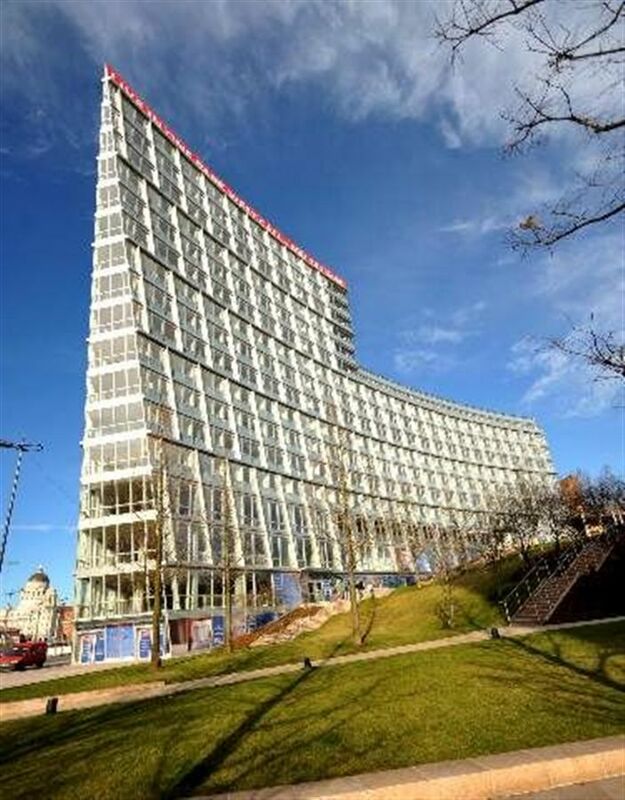 Liverpool One, a master plan designed by Pelli Clarke Pelli Architects, is a new urban site located on Liverpool’s waterfront that offers residential, commercial, and retail space in the city. This plan was designed to create a central location for the city on a site that was underused and unattractive to businesses. The central organizing feature of the plan is Chavasse Park, a recreational area in the built over the car park and anchors the new buildings around it. This two-hectacre park is the main green space for the area, and uses terraces, buildings, and winding pedestrian paths throughout the park. On the northwest corner of the park is a large, rolling landform in the shape of an ellipse. This mound rises gently and ends the park at the One West Park apartment building, which steps down and embraces the ellipse to merge with the mound at the boundary. Although the site was completely developed, that does not mean the buildings are less attached to it. The site was designed to link the quarters of the city together into a more unified structure, and the park in the middle is hub for it all. The buildings embrace the site with curves around the boundaries and the park changes topography to minimize the boundary between the interior and exterior. This plan is relevant to my design for the Ft. Ancient development because it emphasizes the transition from site to building very well. The One West Park building seems to grow off of the mound and stands tall over the park, creating a monumental-like structure at the edge.